This is it, the moment I have been waiting for. Hours of practice, of honing my edge, of polishing until I gleamed. All of it leads up to this one day. It is the first time on a mission for me and my owner. We are both nervous, but I think he more than I. I was made to cut through flesh and bone. To protect those who are important to me, to him. I hear from the others the first time is always the hardest for our owners. That taking of life, but for me it is just something I can do. Like my smaller cousins who cut the meat for dinner, or the vegetables to be cooked, I am just an instrument. Something to be wielded by my owner’s hand to do his or her bidding. I am more specialized though. My job is to cut through the bone and flesh of living creatures. Creatures that look a lot like my owner. It is strange to think that I must kill them. They are so much alike in so many ways. They all sleep, eat, breathe the same. From what I have been told they all bleed the same color. Red. So why do they kill each other? I was told the others started this particular war. Threatened those my owner is sworn to protect, and if they are not stopped they will kill or enslave them all. My owner calls them the enemy. I wonder, those of my kind that the enemy carries. Are they as bloodthirsty as their owners? Or are they like me. Silent and cold. Lying in wait to be used by the human hand for whatever purpose they deem necessary. I have seen older ones like me, mounted on the wall like some trophy. They have fought great battles and have been retired, whatever that means. Maybe someday I will be up there with them, on that wall of honor. My owners boasting of the great battles they fought with me. Or maybe today I will find myself lying in the mud, my owners body nearby, silent and cold as the steel I am made of. Until then I will stay in my warm leather sleeve, waiting, wondering, what the day will bring when I am finally brought out to fight the battle for those who wield me and my brothers and sisters, so their families can remain free. Friend of mine Tweeted me the picture and my mind started working, so I just went with it. Not exactly a murder scene, but a prelude to it. 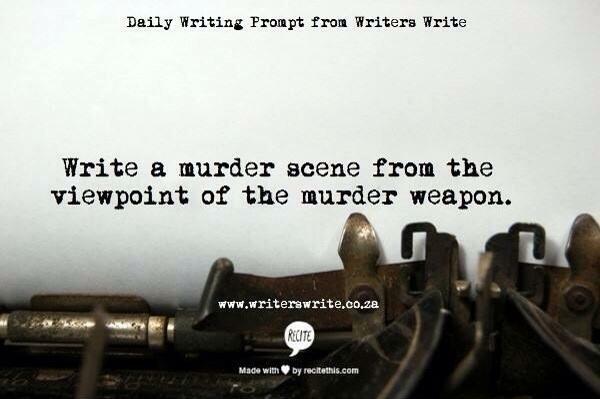 I had started out thinking murder scene, but as often happens my muse went a slightly different direction. Heidi … this is totally amazing.